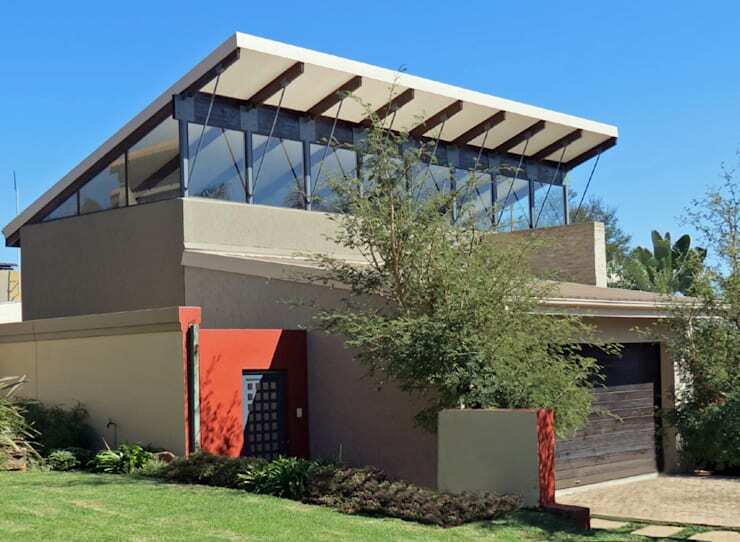 In this edition of homify 360, we visit a simple and elegant home in the affluent neighbourhood of Bedfordview, located on the East Rand area in Gauteng, one of the major inland provinces of South Africa. The home is distinguished in its sophisticated and modern exterior, making it attractive, appealing and eye-catching. It's a great choice for a young family that value space, sunshine and the comfort of glorious outdoor space to enjoy social occasions and entertaining loved ones. But, let's take a closer look! Our first glimpse at this pleasant South African home takes us to the terrace area in the backyard. It's a perfect social space and an elegant extension of the interior. Spending mornings on the terrace in the sunshine is a great way to get started with that cup of coffee, or how about catching a tan on the sunbeds while drifting off to sleep in the afternoons? And while the swimming pool might be quaint, it will make the world of difference during those days when the sweltering heat gets too much for the residents. From this perspective we can appreciate the design of the exterior, the architects of this sensational modern home made use of simple geometric and modern features to make this home inviting. The slanted roof with glass detail also promises that this home is perfectly warm and cosy, regardless of the season, while also adding to the unique style of the house. 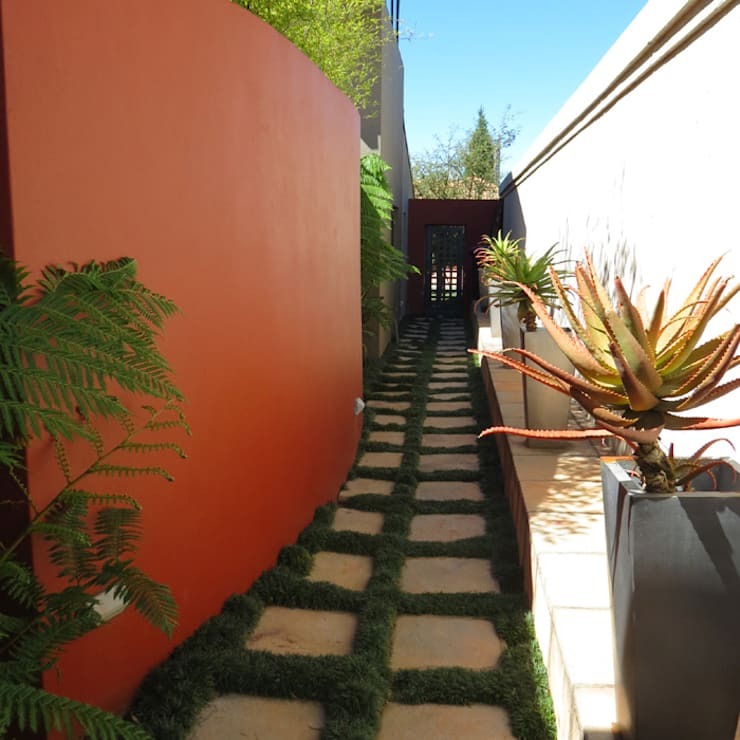 This pathway is a great use of space, allowing visitors to be transported from the exterior of the home to the main entrance and the home itself. The pathway has been perfectly decorated with greenery and pot plants, adding an enchanting aspect to this home, but creating that magical and welcoming feeling of a homely villa. This home is neutral and contemporary, with modern design and excellent choice of colour decorating the exterior. The large garage ensures parking for family vehicles, while a drive away can be used as off-street parking for guests too. The surrounding greenery makes this home even more inviting from the exterior. 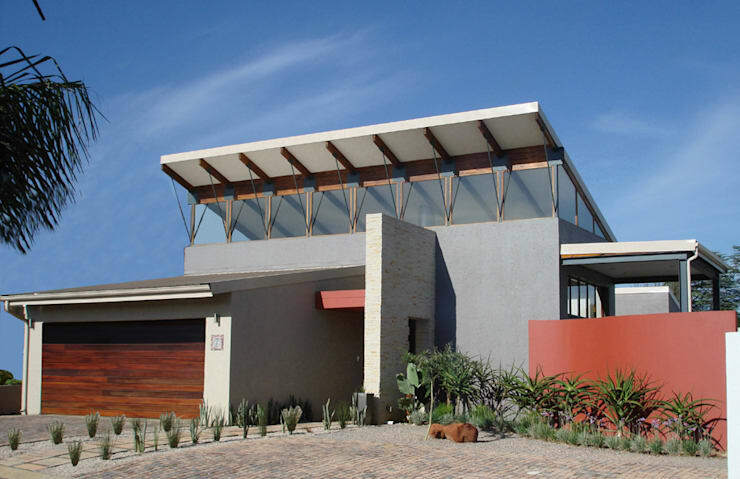 It's definitely a fantastic choice to showcase South African architecture. 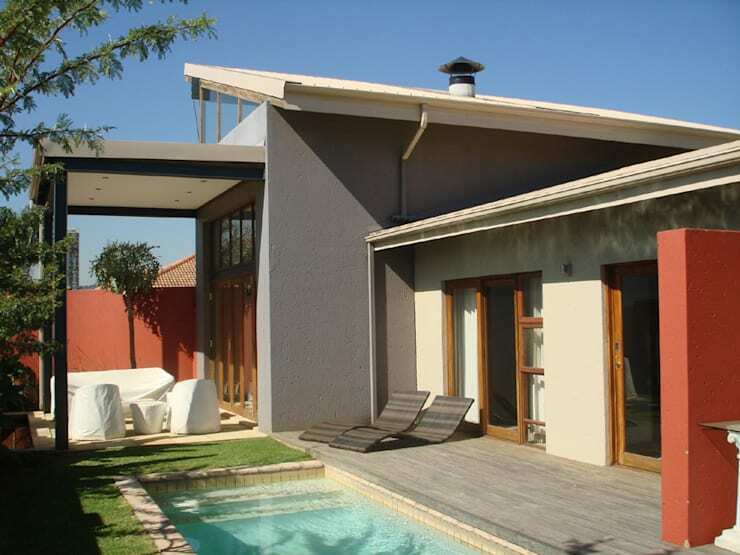 A rustic but modern home in Rustenburg is another great South African design. What did you like most of this South African home?